Fan Boy Forum: Fanboy Forum is Here!!! 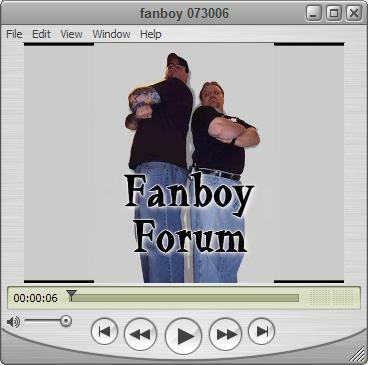 Fanboy Forum is a gathering place for all things related to movies, comics, toys, cartoons and all things Pop Culture we sometimes do a show, skits, interviews and anything else we can think of. Fanboy Forum and ICFTB.com, Where Pop Culture Lives! Hello and welcome to Fanyboy Forum! What is Fanboy Forum......well you will just have to watch the video to find out! Rob and I hope you enjoy it and let me know what you think! Ps, this episode is about 10 minutes long, in the future most will be in the 5-6 minute range some less some more...but hey this isn't TV so we are going to keep it short and sweet, but still be ourselves....because we promise to tell it like it is and pull no punches! Move over, Ebert and Roper. I am Rotten Eddie and I love ICFTB.com. Don't you want to love ICFTB.com too.